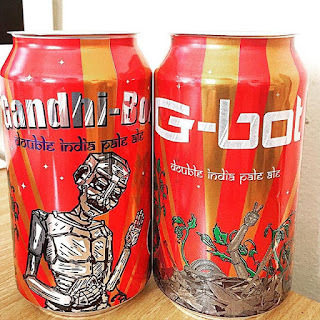 "G - Bot is an intensely hopped Double India Pale Ale brewed with a blend of three varieties of American Hops. 85 ibu’s this beer is brewed for those of us who need an aromatic and flavorfully hopped beer." For those of you outside of New England, let me just give a brief synopsis of the story behind G-Bot. 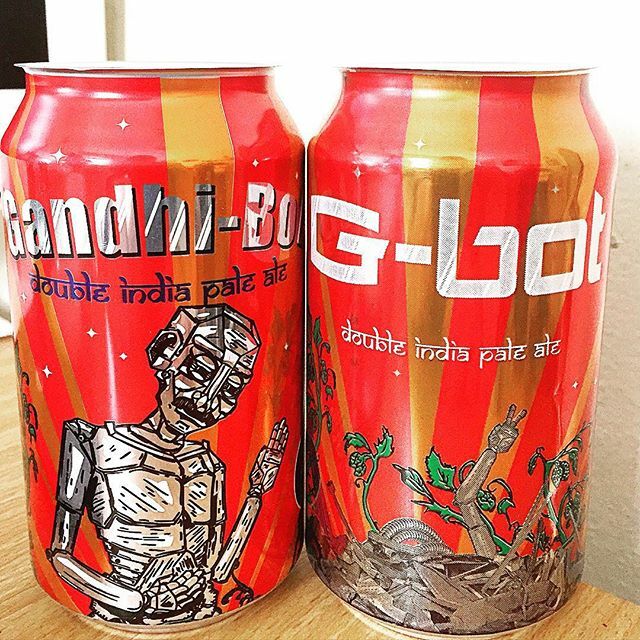 Formerly known as Gandhi-Bot, this DIPA from NEBCO gained minor national fame last year when it was the subject of much controversy due to the use of the name and likeness of Mahatma Gandhi. Oddly enough the beer had been around for years before people started getting mad, but hey, I'm not one to decide what people get offended at and when they choose to do so. In any case, the brewery happily complied and now we have the same exact beer, but with a new name. Pours a hazy light orange with two fingers of thick, fluffy, white head. The aroma has an interesting combination of pineapple, oranges, and garlic. Seems odd, but I don't hate it. The Northeast has gained a reputation for having these juice bomb IPA's, so if you're expecting the same old song and dance from G-Bot, then think again. I'll admit that the first splash of flavor that hits my tongue is similar to peaches or apricots with some dry bitterness, but the transition leaps to significant spicyness and familiar garlic and onion. The hop intensity is hard to escape on the back end and is similar to big Stone Brewing IPA's, which is some nice company to be in. Mouthfeel is as good as you can get for an 8.5% DIPA. At no point is this feeling thick or syrupy. The intensity of the hops doesn't hinder the drinkability as the flavors make it enjoyable rather than it drying out your mouth and making it overly bitter. No alcohol to be found and not even a warming sensation is present on each sip. 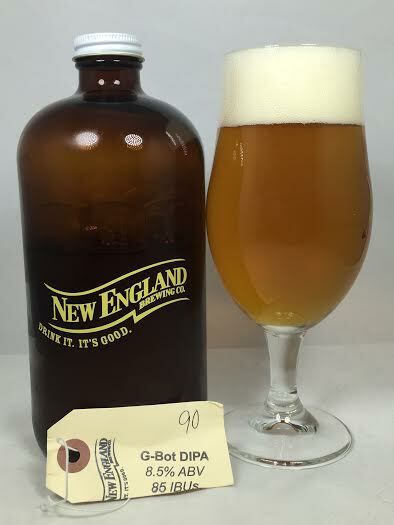 While you won't get a juice-dominant IPA, G-Bot has managed to make spicy and earth hops into a drinkable DIPA. The aroma and flavor combinations are usually a small turn-off for me, but I found myself enjoying this as a nice change-of-pace New England (the region, not the brewery) IPA. Sometimes I'll try to find something that leans more towards the spice rack of hops rather than pure citrus, but drinkable ones in that category are hard to come by. G-Bot has captured my desire and the biggest letdown is that it isn't easier to acquire.